Our spokesperson for the planet is not who you’d expect. Nodding to the pony hair display of trendy shoes in a local department store, a fellow shopper recently commented, “Well, if you want to wear hair.” I lamented and moved right along. The question I’d like to raise is — will our kids help to shape a better respect for this planet? We teach our kids to give thanks for our possessions, however they’ve been obtained. Our ancestors were hunters, as we need to be for survival. My concern is about preservation of the species. For example, wearing shearling in Florida is eccentric. And if you want shearling, shaving the wool from sheep to make gabardine woolen suits can be obtained using synthetic, manufactured wool. David Attenborough. The Living Planet. 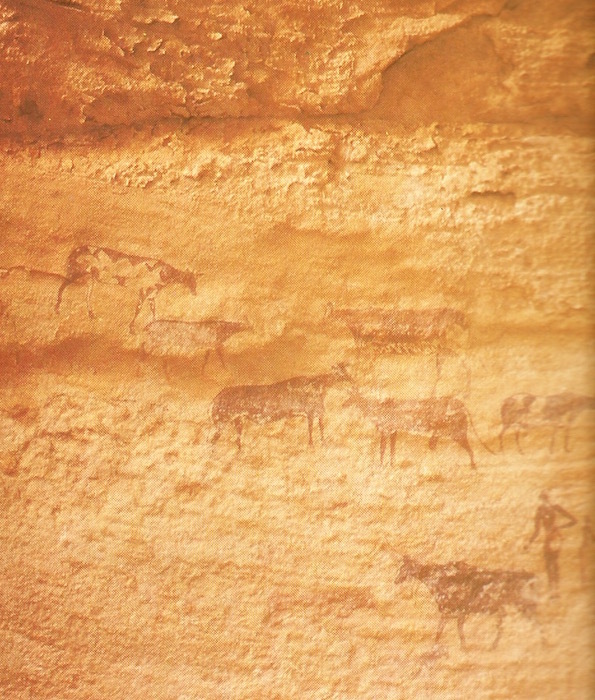 Rock painting of cattle and herders, Tassili. Little Brown and Company. 1984. What comes to mind today, do we teach, do we guide our kids to survive like the cypress trees? Many lessons I’ve learned over time is what seems to give me a better perspective on what not to do. My mind and body now tell me almost automatically. Specifically, my subconscious works for me around stressful, meaningless banter. My focus then is on the task at hand. Cooking, writing, talking, walking, sharing, etc. Our neighbors are quiet most of the time but make a statement in a much larger way. On the street, they are observant, follow the rules, and focus on what is most meaningful. I commented on Hannah’s bike helmet, as you see pictured. 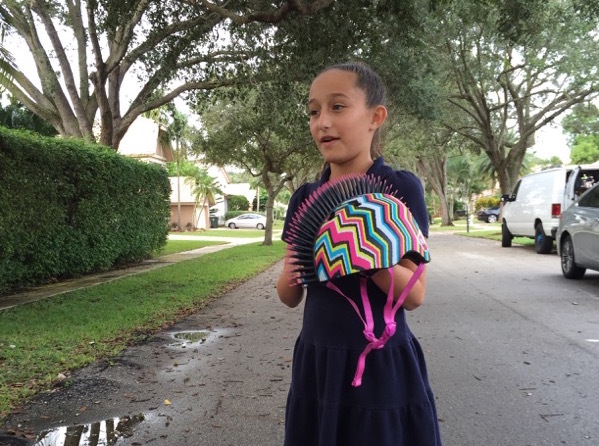 At age seven, she has poignantly commented, “I bought it with my own money.” The look of surprise on my face might have brought the Great Wall of China down. Thinking of my own values I grew up with, her words resonated with me. Why do we need to aimlessly consume, overspend, and waste? If we could just buy with our own money, I imagine we would be in a lot better shape with climate change (or global warming from greenhouse gases). Our choices would likely be need versus want, so much so that we would learn to make do, and we would learn to have a better respect for what we have. Hannah’s dad Shane sits in a chair on their front lawn. His gaze does not leave Hannah or her brother. He is within a 10-ft earshot where the children play. Shane has smiled and waved hello. Will Hannah and her brother be able to spread their roots, tomorrow, to hunt as needed, to find water to flourish, and to see better days than what we have to wrestle with now? I’m interested in hearing the voice of our children how they feel about survival of the species. Am I alone in this thinking? Having hope gives us much to envision for our children and their survival. The diseases which the School of Public Health refers to include those that are vector borne, due in part to wider distribution of insects. The current threat from the Zika virus will be one such vector borne disease. Of course many meanings can be derived from these lyrics. The point is, our failure to deal with the issues at hand, for example, the climate change talks, and the lack of commitment, shows our priorities are mixed up. So we’re exposed to a society like North Korea that appears to be more concerned about having a hydrogen bomb in hand than the dynamics of agriculture and trade. My goodness, will our planet’s children ever have a chance to change that? We need more Hannah’s and Shane’s who give our children a good life–who make us think we can do with what we have. Stop burning coal from the factories. Make healthy substitutes for hairy clothing so we can still have fun in the fashion sense, but that we give our animals a chance to contribute to the planet’s critical ecosystem. In turn, these may provide food securities–and that we may be more amenable to international cooperation and trade. How can we do all of that? We have to first ask the right questions. Are we teaching our children the right things? Our children need to understand what to hunt, what to eat, how to spend, how to treat others with respect, and so on. Teaching our children in this context will give each and every one a chance to make our planet a better place than what it is today. For tomorrow, we hope we both shall live.